By "respiratory system" we usually mean the passages that transport incoming air to the lungs and to the microscopic air sacs called alveoli where gases are exchanged. The term respiration refers to the whole chain of processes from the inhalation of air to the use of oxygen in the cells. We can inhale by lowering the diaphragm to expand the volume of the chest cavity. By the ideal gas law we know that an expanded volume will lower the pressure and allow air to flow into the lungs through the bronchial passages. Exhalation can be accomplished by just relaxing the chest and allowing the elastic recoil of the alveoli to force the air out of the lungs. This elastic recoil is related to the wall tension of the alveoli and behaves according to LaPlace's law. The above diagram follows the perspective of Thibadeau & Patton. Upon inspiration, the pressure in the alveoli is on the order of 2-3 mmHg below the atmospheric pressure of 760 mmHg. The relaxing of the diagphragm plus the elastic recoil of the alveoli provides a pressure some 3 mmHg above atmospheric pressure to accomplish expiration. At right is a sketch of a lung model used to demonstrate the nature of the breathing process. A rubber membrane simulates the action of the diaphragm. Gas exchange in the lungs takes place in the tiny air sacs called alveoli in the lungs. The process of inhalation must inflate the alveoli, but it can only do so because of the presence of a surfactant fluid that coats the alveoli and lowers the surface tension of their walls. 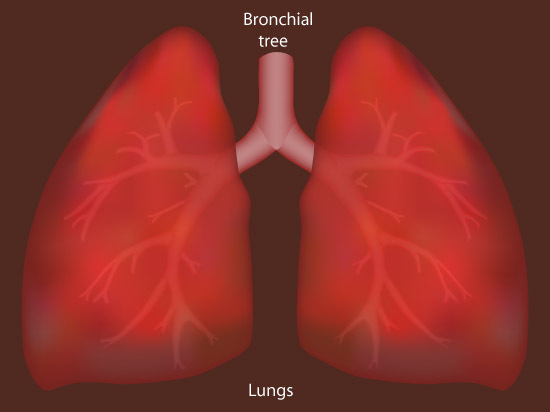 The lungs have millions of alveoli (Thibodeau & Patton) and each lies in contact with capillaries. The combination of the alveolar wall, the capillary wall and the basement membrane that lies between them is a very thin barrier across which oxygen and carbon dioxide diffuse readily. Transfer of oxygen and carbon dioxide across the membranes occurs by diffusion, but the solubility of these gases in the material of the membrane also play a role. The influence of solubility on diffusion in modeled in Graham's law. Almost all the oxygen (over 98%) is carried in the blood by attachment to hemoglobin, a protein in the red blood cells. As oxygen is dissolved in the blood, it rapidly combines with the hemoglobin to form oxyhemoglobin. Each hemoglobin molecule can bind up to four oxygen molecules.